The FreezeAlarm Dialer FA-700E is a cost effective way to protect your home, cabin, or business against winter freeze up and the resulting water damage caused by frozen, burst pipes. The FreezeAlarm Dialer FA-700E will automatically call out using a landline phone connection to a pre-programmed telephone number if the temperature drops below 45 deg F (7 deg C). 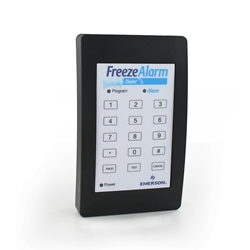 Additionally, the FreezeAlarm Dialer FA-700E can be set to alarm if the temperature rises above 85 deg F (29 deg C). Make the FreezeAlarm Dialer FA-700E your home or business temperature monitor – for low or high temperature extremes! Monitor your home or business for an unexpected RISE in temperature too! * The FreezeAlarm Dialer FA-700E will continue to dial to the pre-programmed telephone number if the phone service remains active during a power failure. Some digital VOIP, cable phone systems and DSL phone services do not operate during power failures. Check with your phone service provider for questions about how your phone service operates during a power failure.